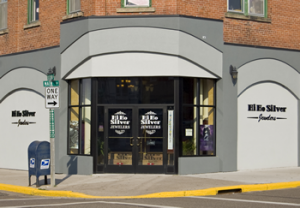 Welcome to Hi Ho Silver, one of the most unique jewelry stores that you’ll ever find. When visiting our store in Hayward, Wisconsin, we know that you’ll be able to find exactly what you’re looking for. In business since 1975, we have established a solid reputation and loyal customer base that continues to grow. Here you’ll find some of the finest handmade jewelry in the world. We team up with hundreds of artisans across the globe to bring you selection and quality beyond compare. 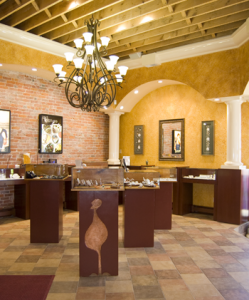 We specialize in custom gold and silver as well as rare exotic gems and one-of-a-kind pieces. If you don’t see what you’re looking for, please ask. Chances are we can find it, and we’ll make every effort to do so… but if we can’t… perhaps we can create it for you with our custom design services. In addition, we carry a wide variety of precious and semi-precious gems including diamonds, Baltic amber, turquoise, and Zultanite. Hi Ho Silver is also a registered dealer of Victorinox Swiss Army Watches, Benchmade Knives and Trollbeads. So, if you happen to be in Hayward, we’re located at 15836 West Second Street, Suite #1. If you’d like to call, our number is (715) 634-5052. Regular business hours are Monday through Friday 10am to 5pm and Saturdays from 10am to 4pm. We’re open on Sundays during the summer months. Oh, and if you happen to see something you like on our website… please give us a call (715) 634-5052!